Uses: Hand-stitching is great for when you want more precision in your sewing, when you don't have a sewing, or you are doing couture garmets. Here's a cool trick I picked up in sewing class for tying an easy, fool-proof knot. Step 1: Thread your needle. Holding the ends of the thread horizontal, place your needle perpendicular to them, making a cross. 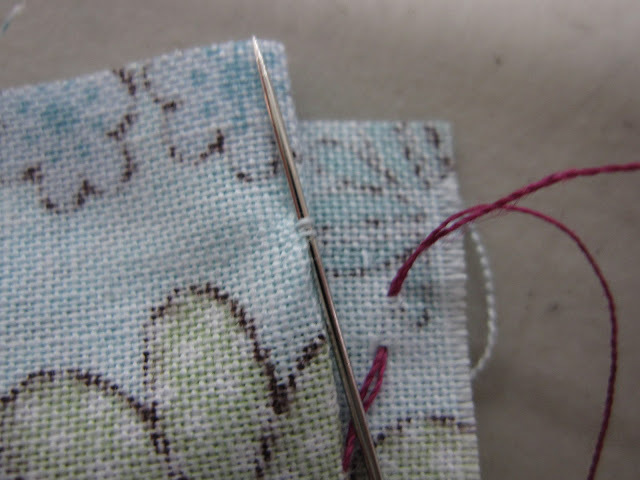 Step 2: Using the thread from the left, wrap it two times around the needles. Step 3: Grasp the thread you wrapped around the needle between your thumb and index finger. Slide it down the needle and down along the thread toward the end. It will make a nice knot right near the end of your thread. Waxing your thread: OK, I'm not going to lie, I don't do this step. But according to those in the know, it helps make your thread thicker and stronger. Alternately, you can just buy waxed thread. To wax it yourself, buy a needle waxer and slide your thread through it. 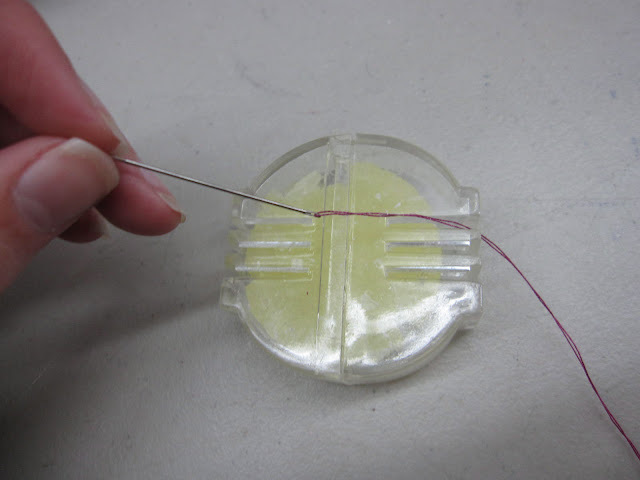 The weird part: If you are going to wax the thread yourself, you are going to have to do this step. It may seem a little neurotic, but ironing your self-waxed thread will keep the wax from coming off during the first stitch you make and balling up (read: staining) your garment. So, run your self-waxed thread briefly under a hot iron. What it is: The backstitch makes a nice, secure stitchline with one stitch right next to the other. Step 1: Poke your needle up from the wrong side of the fabric. To sew across your fabric from left to right, insert your needle to the left of the knot and pull it out to the right. 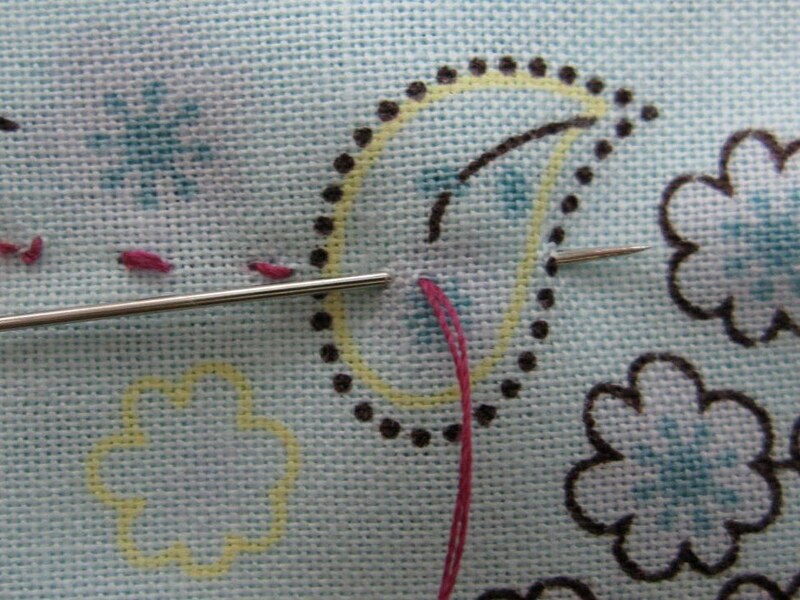 Step 2: Continue in this fasion, inserting your needle where the last stitch ended and pulling it up at an equal space the right of the thread. What it is: This is a variation of the backstitch that makes cute little traditional-looking stitches. Step 1: Start your row of stitches as you would for the backstitch. 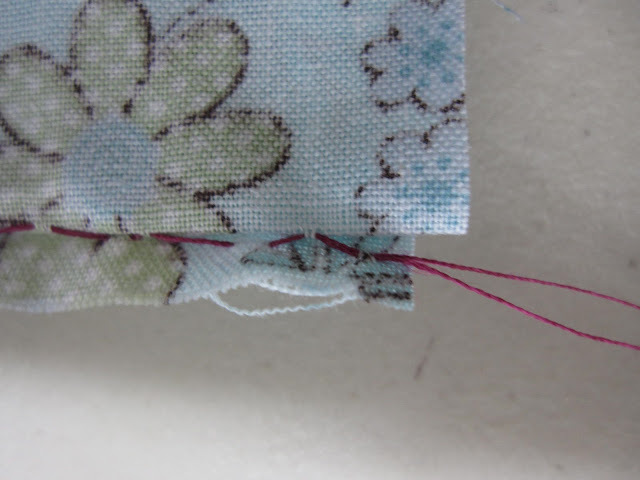 Step 2: Unlike the backstitch, don't insert your needle where the last stitch ended. Instead, leave a space. What it is: The blind hem is a way to hem a garment without leaving a big ol' topstitch line. To do this by machine, click here. Step 4: Stitch one stitch on the side with the raw edge. This will not be visible from the right side of your garment, so don't worry if it isn't perfect. Then, pick up one or two threads from the folded edge, right along the fold. Step 5: Repeat step 4, being careful not to pull the tension too tight. Step 6: Unfold and press your hem. Only the little tick marks should be visible along the right side.